Sharing my researches, explorations and projects in photography, visual art and design is what makes this space unique. I did an experiment in the summer 2017, which influenced me to choose this project. The experiment was a silent meditation course. 10 days of intense meditation in which I gained my focus that I had lost in an event seven years earlier. I thought it is bad especially for a photographer to lose the focus and live in a parallel universe. I understood the importance of the present moment and learnt every moment is a decisive moment! Even though in meditation we stay still in one position for long hours, there are a lot going on inside us. This made me thinking to share my experience through a moving image. This project was originally called Satori, which is a Japanese origin word and it means sudden enlightenment. I was inspired by Andy Warhol’s 3 minutes screen test videos, in which many sitters, including Salvador Dali stayed still during the 3 minutes. Some consider Warhol as the father of today’s media and I certainly agree with them. His early films are moving portraits. Today we see a lot of animated Gifs and cinemagraphs that are basically Warhol’s influence. His later films are the core concept behind the reality shows today. Another inspiration was from a short film by Nacho Guzman, which shows the light effect on a face. What I like about it is the colours and light that changes the face expressions. To me lighting makes the expression and colour gives it a mood, a feeling or maybe a thought. Another inspiration came from Cubism and some of Picasso’s paintings. I have always been fascinated by the idea of cubism. Making collages is the dominant technique in my professional photographic practices. And when I think about it, that is what we do in meditation to monitor our body. We focus on a small part of the body to feel the sensation there is and monitor the whole body part by part. Cubism is about time. It is about seeing things as a whole. Seeing with the eyes and the mind. When I look at this painting by Pablo Picasso, I feel I am spending time with Ambroise Vollard, his sitter in the painting and art dealer. I then thought of separating the head and the body to reflect on the identification with the mind and observation of being. And decided to make two separate videos, which could join together in an installation. I looked at Darren Bade's sculpture and imagined my installation if I was showing it in a gallery space. Having a clear vision of what I wanted to achieve I started shooting. However, I knew there is always room for developing the idea and was open to listen to the feedbacks I was going to receive. One of the most constructive feedbacks I received was from my tutor, Yaron Lapid. I certainly didn’t want to communicate that I was enlightened after my experiment, so I started rethinking about my editing. More than anything this was an opportunity to develop my editing skills. In the beginning of this project I had a very limited knowledge on Adobe Premiere and After Effect. Throughout this module I practiced a few techniques in editing and now I am more confident in working with these applications. Here are a few attempts and my journey to the final work. "Ask me questions and let me think" is the title I chose for my final edit, which will be used on my website and social media to respond to the questions it may be opposed to me. The video is composed with 4 different videos and a layer of colour on the top, which reflects on the abstraction of thoughts and my colourful mind. I intentionally divide the videos to make a collage to break the linear time and question it. The title, suggests that there is always a question and if there is you can ask me in the comments. I get different questions. Some of them I have no idea, some needs to be responded in text, some can be discussed in audio or video. This first video is in response to no question or could be read as the all questions. Here it is again, the final video. Watch this time maybe in smaller size. Somebody asked me who Enkidu is. The one I know is the character from the epic of Gilgamesh. I thought I would make a video about Enkidu. The next short film is about Enkidu's death. In the Epic of Gilgamesh, Enkidu who had become the king's companion dies in his youth. His death deeply affects Gilgamesh and inspires the king to escape death by searching for immortality. This is a narrative about Enkidu's death sometime around 2700 BC. According to the tablet 7 in the epic of Gilgamesh, Enkidu had a slow and painful death. That's why I chose his death to show in moving image. The film is slow and almost painful rhythm. Enkidu is being described as a hairy creature made of clay and water. I thought who can be more similar to him than myself. Not only that, but also I am from the same geographical region in the world as Enlidu was. The project started with a few selfie on a flatbed scanner. Originally I called the scans 'Trapped in time and space' because that's what they are. You are limited to the space of a scanner and the time it takes to scan that space, which depending on the resolution you choose to scan this time can change. This change in time gave me the opportunity to move and play on the surface and create my distorted images. Then I thought how I could show this period of time in a moving image and reveal the images in the way the scanner record them. I recorded the open scanner with different resolution settings and matched it with the sound. Then it was easy to create the effect in Adobe Premiere. The video is about 6 minutes long and it reveals 4 images starting with a 300dpi scan, which is reasonably quick and as it goes to 600dpi, 1200dpi and 2400dpi it gets slower and slower. There is an element of force within the sound and the images, which in my mind reflects on Enkidu's painful and long death. On the other hand, the images remind me of fossils, the force of nature on to once living creatures that have frozen them in time. There is not much quality difference in images shown on screen. It wasn't my intension to emphasis on the visual quality but the time itself. The time that has passed and the time that is passing. Last but not least the narrative. In the first act or the first image, there is a suspicion of a looming danger. It's the only portrait with the open eyes in this narrative. The second act is about stretching for the last breath. The third frame is a dead crushed face and finally the last frame is a whispering fossil. In making this short moving image, a short film called 'The copy shop' by the Austrian filmmaker, Virgil Widrich influenced me. I saw it first in 2001-2 at Tehran's Animation Festival. It hooked me at the time and still does to this day. 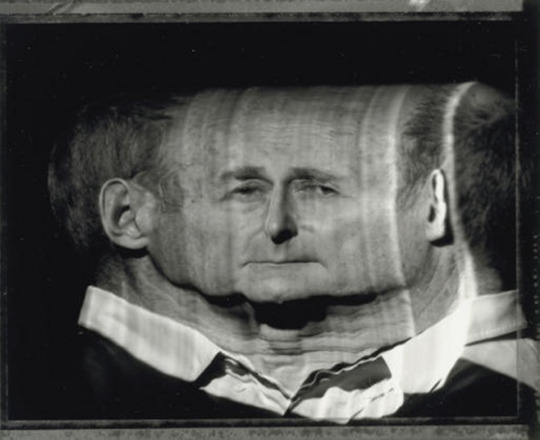 Other artists including Irvin Penn and Xavier Solé have also created some beautiful scanner portrait, which I looked at. The other inspiration was from "12 Nantes Triptych", a three panel video installation by Bill Viola in 1992. The video is about birth and death. The main element I like in Bill Viola's work is his presentation. My video is designed to be shown in a gallery space on a large screen, where the visitors don't have to sit and watch the whole film from start to finish, but they can look at it from wherever they are and whenever they want to look at it. The video in gallery will be on a loop and without titles. Here, however, is the final work for online platforms. If you haven't seen it all earlier, here is your another chance. Last is an animated Gif image, which I called it "Anti Time Wise". I followed the American film director, Jim Jarmusch for so many years. In his 1991 feature film, "Night on Earth", I liked the transitions between the episodes to move from one city on Earth to another at the same moment. The whole project is about time. I think time is an illusion. My job as a photographer is to capture the moment in time and fix it for ever. In the last 3 months, I have been focusing on time and my understanding of it. My interest in the subject of time started before or after a silent meditation course which I experienced in summer of 2017. It is difficult to say if it was before or after the event, if you believe that time is an illusion. Technically, there is no before or after. There is only this very moment that you are living. Right now! Since the silent meditation course I have developed a different way of thinking and processing time. Every single moment that has past has been a present moment then and every moment that shapes the future will one day become the present. It’s all just one. One single tic in the clock. And once you hear the the toc, it’s gone. My photographic practice is influenced by cubism. The idea of seeing as a whole. The idea of seeing not only with the eyes but also with the mind and memory. It takes more than a moment for artist to paint the model. The time will pass and every living cell in the model and the artist will grow and die and gets replaced with new cells. There will be movements. Artist will look at the model from different angels during the process. • A 6 minutes video art originally aimed at showing on a loop in a gallery space. Here presenting the online cut. • An animated Gif image, few seconds loop. I know Enkidu from The Epic of Gilgamesh. -Enkidu (𒂗𒆠𒆕 EN.KI.DU3, "Enki's creation") is a central figure in the Ancient Mesopotamian Epic of Gilgamesh. Enkidu was formed from clay and water by Aruru, the goddess of creation, to rid Gilgamesh of his arrogance. In the story he is a wild man, raised by animals and ignorant of human society until he is bedded by Shamhat. Thereafter a series of interactions with humans and human ways bring him closer to civilisation, culminating in a wrestling match with Gilgamesh, king of Uruk. Enkidu embodies the wild or natural world. Though equal to Gilgamesh in strength and bearing, he acts in some ways as an antithesis to the cultured, urban-bred warrior-king. Enkidu then becomes the king's constant companion and deeply beloved friend, accompanying him on adventures until he is stricken with illness and dies. The deep, tragic loss of Enkidu profoundly inspires in Gilgamesh a quest to escape death by obtaining godly immortality. In response to the question, i created the second video ad a very slow loop telling the story of Enkidu’s death. Based on the story, Enkidu has a very long and painful death sometime around 2700 BC. He is still dying today. He is dying today inside of every living human. Enkidu is the one connecting us to the natural world and he is dying a lagging and quiet death inside of us. And there it is, the animated Gif, my Understanding of time. - However time is a steady line that always moves forward, it is always shown as a round machine that keeps repeating itself. The picture of the round clock with 12 signs is always one of the first images popping into ones mind after hearing the word time. Is this a coincidence? Or is every moment keeps repeating itself? Is there a difference between this moment and the one that has past? Spring and summer? Are we really moving forward? Sign up with your email address to be informed about my next blog post.